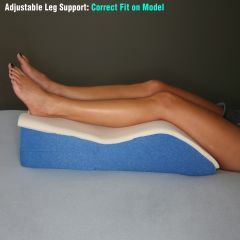 AllegroMedical.com presents The Adjustable Leg Support. Designed to help relieve pressure and strain on the lower back, knees, and ankles. Unique shape fits leg contours and more. Hook-and-loop fastener(s) tabs for maximum adjustability. Washable cover in white or blue polycotton. Size: 10" x 6" x 5 1/2"